Windows Server 2012, Microsoft’s newest operating system release, has generated a lot of hype and controversy. If you haven’t had a chance to download, install, and work with it yet, you should do so right away. Windows Server 2012 works well as a virtual machine (VM), so if you’re short on physical systems for beta testing, install it to a VM on your favorite hypervisor and give it a chance to impress you. The most significant change you’ll see right away is the new “Metro” interface (Figure 1), with its large desktop icons and its horizontally sliding desktop; the old school Desktop interface is available via Windows key magic. Windows Server 2012 has its fan base, myself included, although that wasn’t always the case. When I first looked at the new Metro interface, I hated it – that is, until I discovered that it’s Microsoft’s way of making my life easier by placing the most used icons on the desktop for me, where I’d put them anyway. However, I've told that story in print already. Underneath the large, flat icons and the psychological barriers to Metro, it’s pretty much the same Windows you’ve grown up with over the past 20 years. In Desktop mode, you have Server Manager, PowerShell, and Windows Explorer located on your taskbar (Figure 2). In Metro mode, your Desktop contains icons for Server Manager, Windows PowerShell, Computer, Task Manager, Control Panel, Internet Explorer and Desktop mode – and, that’s from a remote terminal. The console offers the full gamut of administrative tools on the desktop. Figure 2: Server Manager, PowerShell, and Windows Explorer on the taskbar. As a Windows Administrator, you’re likely to spend most of your time in Server Manager, the central application from which to manage one or several Windows systems. 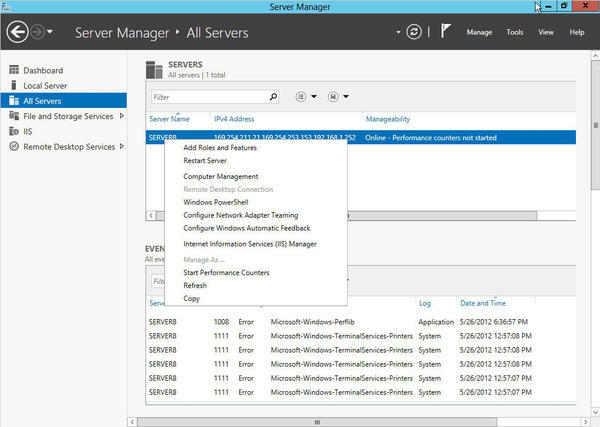 From Server Manager, you can edit your computer name, join a domain or workgroup, change your IP address settings, change your remote desktop settings, manage IIS, manage storage, check events, add roles, add features, and much more. 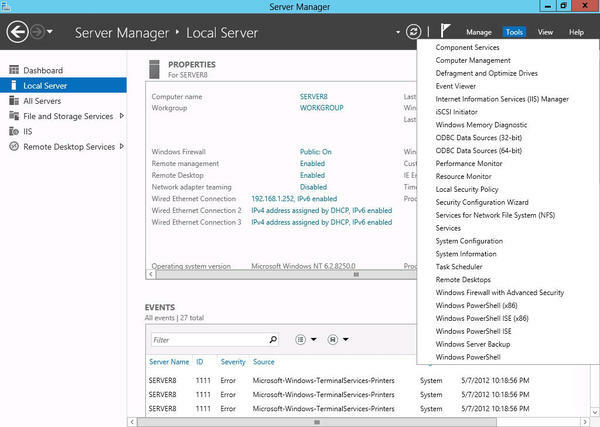 Figure 3: Server Manager’s default view, ready to manage your Windows servers. IT system administrator groups are already planning on 2012’s multiserver management capability by creating management virtual machines, whose sole purpose is to provide a consistent management console to administrators. Beyond the requirement to provide access to several simultaneous administrators, the virtual machine has no special prerequisites. From Server Manager, you need look no further than the Tools selection on the menubar. Older Windows versions located Administrative Tools under Program Files | Administrative Tools or pinned a link onto the Start Menu. Figure 4: Administrative Tools accessed from within Server Manager. Under Tools (Figure 4), you’ll recognize a list of the standard Administrative Tools entries plus a few extras, such as Windows PowerShell ISE (32 and 64 bits), Resource Monitor , and Services for Network File System (NFS) . For the past few years, Microsoft has made an effort to integrate Windows into the heterogeneous enterprise with the addition of NFS support, a Telnet client and server, and an ever-growing list of open source projects known as Port 25. Windows PowerShell 3.0 includes major renovations and expansions, such as more than 2,000 cmdlets, an improved Where statement, Intellisense error highlighting, the Show-Command cmdlet, hundreds of new functions, and much more. Stay tuned to this column for PowerShell 3.0 tutorials. You’ll find many such improvements in PowerShell 3.0. However, realize that PowerShell is a work in progress, and in some cases, you’ll have to revert back to the old syntax on a case-by-case basis. A good clue as to when you’d need to revert back is when you receive no results for a command that worked in PowerShell 2.0. Be aware that although the Where cmdlet is smarter, it still hasn’t reached genius status. The one area in which PowerShell 3.0 currently lacks support is for Hyper-V: this version includes no Hyper-V-related cmdlets. I expect this to change because Hyper-V version 3.0 is a much touted alternative to VMware’s vSphere and Citrix XenServer and because PowerShell is an excellent method of automated virtual machine management, especially for large environments. Previous versions of Windows Server lacked any real IPAM, beyond that of the very basic DHCP allocation and DNS handling. Hyper-V 3.0 is Microsoft’s new hypervisor version that’s poised to go head-to-head with VMware’s vSphere and other competitors in the server virtualization space. It’s anyone’s guess as to how Microsoft will fare against its much more established competition but it’s out there for anyone to use, just in case curiosity overwhelms. It does have some interesting new features such as a 16TB virtual disk limit with its new VHDX disk format, 32 virtual CPUs and 512GB of memory per virtual machine. It seems that the only limitation to a Hyper-V virtual machine is what’s imposed on it by its operating system. Those who would benefit most from Hyper-V are the “all Microsoft” shops and those who haven’t yet selected a hypervisor on which to standardize. For most enterprises, Hyper-V will be a secondary hypervisor technology or potentially a virtual desktop infrastructure (VDI) candidate. Microsoft has made significant performance and licensing enhancements to its newest virtual platform that might sway some companies’ decision makers to convince their IT departments to give it a try. As you probably realize, Hyper-V 3.0 has substantial implications for cloud implementations. Microsoft has relaxed its formerly harsh operating system licensing requirements so that cloud providers can now use Microsoft virtualization technology and still maintain a sustainable profit margin. With its new performance tweaks and higher density, cloud providers are taking a serious look at Windows Server 2012 and Hyper-V 3.0 for future deployments. Further capitalizing on the heterogeneous data center, Microsoft has made it easier to integrate other virtualization platforms into its System Center 2012 management software. In all, Windows Server 2012 is exactly what we expect from Microsoft: a new operating system version that has a few exciting front-end features, many performance enhancements, and some back-end improvements over Windows Server 2008. Alternatively, Microsoft has maintained what works in Server 2012. They’ve surprised us with innovations and they’ve surprised us with tradition. Windows Server 2012 will be a welcome addition to any IT department, regardless of size or complexity. Of course, Microsoft fully expects you to implement Active Directory and domain controllers in your environment. If you’re managing more than a handful of servers and desktops, Active Directory and a domain structure are absolutely required for any management sanity. Active Directory, in case you don’t know, provides a security framework for your users, computers, and services with which you can deliver and enforce security policies. I’ll explore some Active Directory scenarios in a future post and give you a list of all the benefits and reasons for using it. 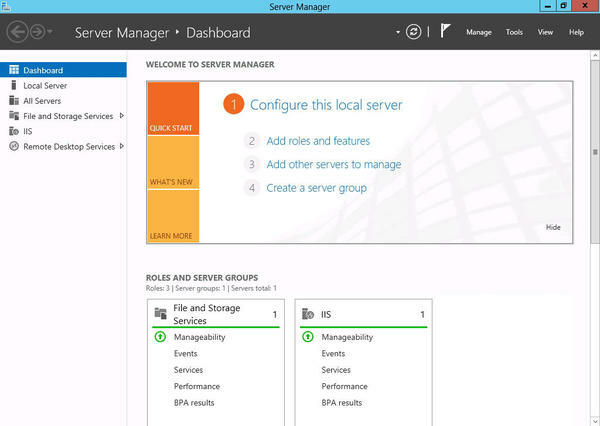 Figure 5: Windows Server 2012’s centralized management features. I haven’t wholeheartedly recommended a Microsoft server operating system since Windows NT Server 3.51, but from what I’ve seen of Windows Server 2012, I see no reason not to migrate to it as soon as logistically possible. Microsoft has proven again why it’s the clear leader in the commercial operating system market. 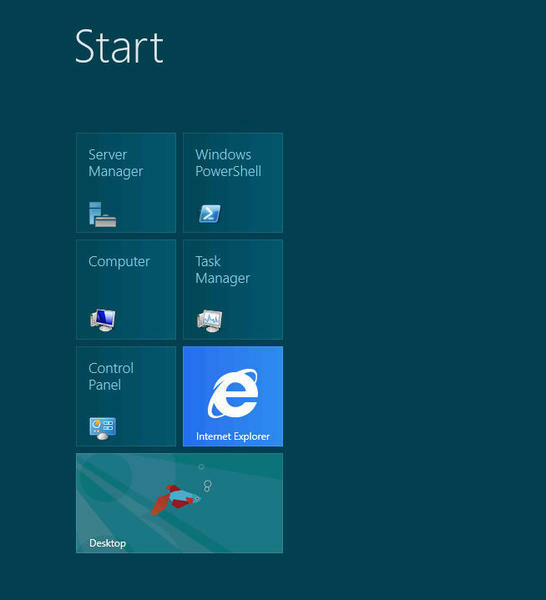 Whatever you’re looking for in a server operating system, Windows Server 2012 has it. If it existed in previous Windows Server versions, it still exists in this one – only better. Throw in its other features, and you’ve got a formidable contender in all corporate network environments, from the very small to the impossibly large.